Happy Monday! If you follow the blog, you know that I've been a little bit obsessed with candy making recently. Candy making is not difficult, but I can see how it got it's shady reputation. The process of heating up sugar to ridiculously high temperatures is very different than anything else you might do in the kitchen and it takes some practice. But once you've done it a few times, you start to realize that the heat does most of the work, and all you really have to do is lend a watchful eye and choose your favourite flavour! If you're a baker or a cook who has never attempted candy, I encourage you to do so. After following a few recipes you'll be making candy canes and marshmallows as easily as you would biscuits and brownies. 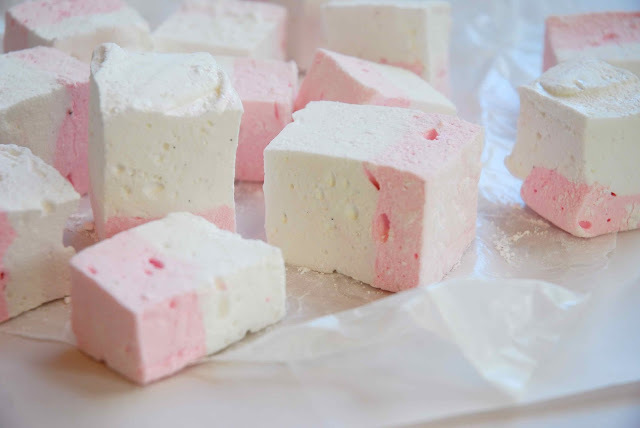 A few months ago I made my first homemade marshmallows. They turned out beautifully. I made big fluffy coconut clouds and small dainty rosewater treats. I was totally hooked on my new candy, and after a few batches (and some helpful but annoying trail and error), I had a fun thought- what if I combined two flavours? I pictured a two tone marshmallow with not only two flavours, but two colours. Well, the doublemallow turned out to be a cinch to produce. They practically leapt off the drawing board and onto the table! 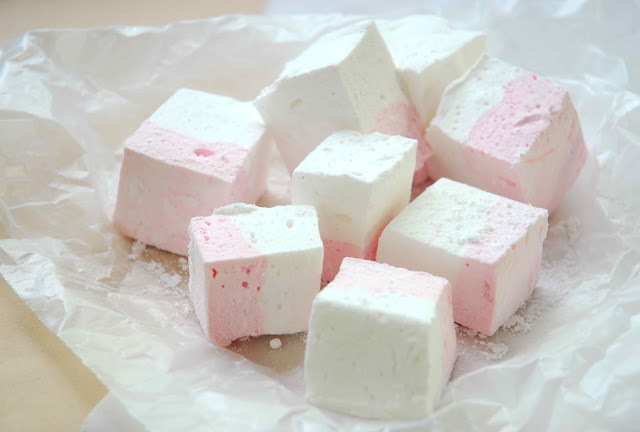 Of course, making two batches is more work (and way more dishes), but the fresh marshmallow is so incredibly sticky that the two batches can't help but fuse together. And they easily form the perfect two-tone treat! 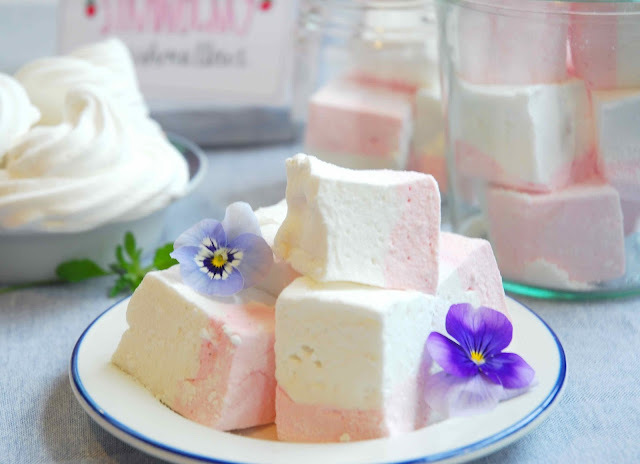 Begin by making a batch of marshmallows following the instructions given in my post, Rosewater Marshmallows. Colour and flavour the first batch however you like. Pour this batch into a greased and sugared 9x13 inch cake pan. Do not try and cut the original recipe in half, as there won't be enough liquid for the stand mixer to mix it. The recipe I've given is close to being the minimum amount. While the first batch is setting, begin a second batch of marshmallows. Prepare them according to the recipe; flavour and colour the second batch to compliment the first. When the second batch is whipped and ready to be poured, simply pour it on top of the first batch and use a greased spatula to spread it to all corners of the 9x13 inch pan. Once marshmallows have set (overnight or 6-8 hours), gently remove the entire sheet of marshmallow from the pan and place on a sugared cutting board. Cut candy into squares and dust generously on all sides with icing sugar and/or corn starch. Alternatively, you can cut marshmallow out with cookie cutters to make simple shapes like circles (cylinders) or hearts.